Less pimples. Smaller pimples. Less inflammation. Good for liver. Helps form bile. Antioxidant. Decreases blood sugar. There are no cons. This is good for you. There are no adverse effects of up to 3 grams per day. I can't believe no one reviewed this, so I have taken it upon myself. Taurine has decreased my acne by about 30%. That is a lot for just a single supplement.Your body actually wants this supplement; it's not like B5 or vitamin A megadosing. 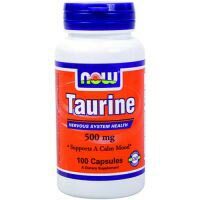 Taurine needs vitamin B6 to be absorbed. Without B6, Taurine does nothing for me. Currently I am using 1/16 of a 50mg B6 supplement per day, only because my weak body can't tolerate any more. Others have had success with a B25 complex. I recommend 1 gram of taurine 3 times per day, and 1 B25 complex IN THE MORNING, so it doesn't interfere with your sleep. If you can't tolerate the B25 complex, just buy a B6 supplement and break it into pieces that are small enough for you to tolerate. Taurine only needs about 3mg of B6 to be absorbed. Also, this is unrelated to taurine, but zinc(gluconate) has cleared my skin by about 40%, so i also recommend a 50mg zinc tablet WHEN YOU TAKE B6. Vitamon B6 also helps the absorption of zinc. I get all of my supplements from [link removed] For more reliable information about taurine, search the message boards for threads entitled: Fructose, Insulin, and Taurine! and So, how many of you have taken Taurine and what were your results? I sincerely hope this helps you in your goal to rid yourself of this horrible plague.